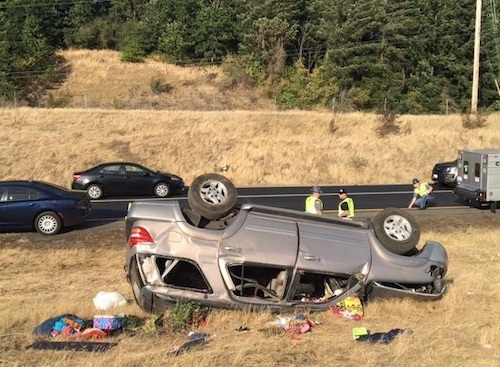 Three people were killed and three others injured in a serious rollover crash on northbound Interstate 5 in Kalama on Saturday, according to the Washington State Patrol. A Toyota Sequoia SUV carrying six people — driven by a mother transporting her parents and three children — rolled over at 4:36 p.m. Saturday. Five of the six occupants were ejected from the vehicle. Only the driver was wearing a seat belt. Both grandparents and one child, a 6-year-old girl, were pronounced dead on the scene. Another child suffered critical injuries and was transported by LifeFlight to Randall Children’s Hospital at Legacy Emanuel in Portland. The mother of the three children and a third child were transported by ambulance to PeaceHealth St. John Medical Center in Longview. Investigators believe distracted driving to be the cause of the accident. The driver's attention left the roadway and when she looked back at the road, traffic had slowed. When she took aggressive action, the vehicle veered into the median and rolled. Reports say the family is from Lakewood and were on their way home from Vancouver after visiting family. When a stranger is responsible for you or a loved one’s injuries, filing a claim for compensation is often a straightforward decision. But when a friend or family member was behind the wheel, the choice may seem much harder. An experienced personal injury attorney can reassure you that in most cases they will be dealing with the family member’s insurance carrier, rather than the family member themselves. Children under the age of 18 that are injured in an accident have the right to file a personal injury claim. A child can and should bring a claim against a parent, as it’s the best way to recover financially after an accident. It doesn’t matter whether the passenger is a family member or complete stranger. Liability coverage covers injuries to both, including the negligent driver’s children. This coverage is intended to protect the family. Every driver with insurance already pays for it. Why not use it? There is no need to feel any guilt when bringing a claim against the insurance company. A parent can and should initiate the claim on behalf of the child. The issues involved in these cases can be quite complicated, and there are special rules and laws related to personal injury claims on behalf of children. 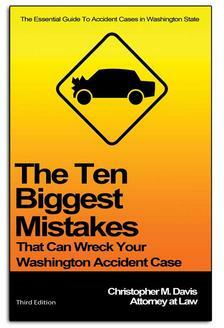 It is important to get legal advice from an experienced car accident attorney. Davis Law Group, P.S., is here to help. Contact us today for a free case evaluation. Call (206) 727-4000 to get started.